Typically they know they have Adrenal Fatigue and they struggle with the symptoms so they set off on a path of detective work. But what that actually does is raise more questions than answers. You might have been through this yourself. You might have explored the medical side of things, the diagnosis, and you’ve got clarity in some areas but you’re still finding you’re sliding back in terms of symptoms sometimes and it’s confusing, frustrating and irritating because what you really want is the answers to the problem. What I’ve found in working with people is that it’s often the unconscious emotions that are causing part of the problem. We all have a shadow self, it’s hard to see that side of yourself without any sort of reflective work or someone else go through that with. So what I find through the coaching process is people are able to explore what’s in their mind, and see how they deal with their limiting thoughts or mental triggers around stress, identifying their ideas for what they are and figuring out exactly what the cause of their problem is. That’s why I specialise in this area and that’s why despite all your best efforts, despite your diligent research and expiration of the topic, your naturopath’s supplements and a researched nutrition plan, you cant find the solution yet. The solution is actually inside you but you can’t see it. It’s hidden. It’s part to do with your unconscious, or subconscious thoughts, and so what I offer women is a chance to explore their thoughts, the limiting thoughts or mental triggers for their adrenal fatigue and stress that are keeping them stuck, to resolve that part of the problem. The rest they’re smart enough to do on their own, they can do all the research and get all the answers but it’s that invisible stuff women need help with in my experience and that’s why I love doing that work because it’s so simple, so quick, and so powerful. There are a couple of ways I help people with this. 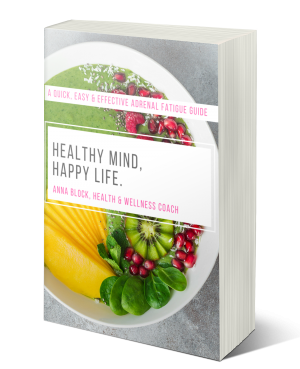 Firstly I have a $7 ‘Happy Mind, Happy Life’ Adrenal Fatigue Guide which for this price is a no-brainer, that will take you through the process to uncover the mental triggers for your gut health symptoms. Or alternatively you might want to have a chat with me about your specific situation, and I say that as an option because you might need a more personal solution. To do that, choose a time that suits you in my calendar. Book your free 15 min mini coaching session here. Approaching Adrenal Fatigue from the source; in how you deal with stress will be the quickest road to your recovery. Please let me know if you have any questions!